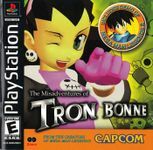 The Misadventures of Tron Bonne, known in Japan as Tron ni Kobun (トロンにコブン?, lit. "Tron and Henchmen"), is a video game that was developed and published by Capcom for the PlayStation. Released in Japan in 1999 and in North America and Europe in 2000, the game is part of the Mega Man Legends (Rockman DASH) series and the prequel of the first Legends game. Rather than focusing on the "good guy" characters of Megaman Trigger and Roll Caskett, the game follows series anti-hero Tron Bonne, sister of the criminal Bonne family of air pirates. The Japanese counterpart included PocketStation support whereas the North American and European version did not. Unlike other games in the Mega Man series, TMoTB bears three distinct play styles, each related to a specific mission. Players are tasked with completing (with gradual difficulty) "moving-box" puzzle stages (containers of various contents in Teche and Primiki Harbor), a Descent-like adventure stage, and several action stages similar to the remainder of the Mega Man Legends series (robbing a bank near Gold City and exploring the Nakkai Ruins themselves). Another gameplay aspect is a collection mission built into one of the action missions, located in Sart Farm, where you must gather pigs, cows and horses. Players can choose freely among the three stage types at any time, but each level (except for the Nakkai Ruins) may only be cleared once. Instrumental in the game's story is the interaction between Tron and her army of forty loyal Servbots. Each Servbot is given a personality and a few other traits, and the player's investigation and interaction is rewarded with money for the loan, additional parts and weapons for the Gustaff, or other assistance. Servbots also play a role during the adventure and action stages (limited to seven, three or one, depending on the type, generally one leading the others, and called "sniper"), assisting Tron in her quest by ransacking houses or defeating minor threats as the situation and their individual skills warrant. A Servbot's skills may be increased by putting him through training exercises (attack and speed), going on missions (brains) or by disciplining him in the Torture Room (thus lowering the sloth level); in both cases, the effect of the action is determined by a minigame. Some Servbots express their special skill by minigames or by special items.